EGX 2018, Britain’s biggest gaming event, is around a month away now. While big titles will dominate most of the show floor, there are many upcoming indie titles that will be playable. Often without the huge lines. Here are some you shouldn’t miss over the course of the weekend. Phogs is an upcoming adventure physics title that takes the premise of CatDog and derives a unique multiplayer format. Playing as a two headed dog, you can control one head and work together with the player controlling the second or tackle the game in a solo mode. The game will mainly feature puzzle solving that works this unique control scheme. Looking to release sometime in 2019, it’s currently unconfirmed which platforms PHOGS will be launching on. EGX will be a fantastic opportunity to get to grips with this fun innovation on co-op play. Those Who Remain follows the recent tradition of horror game resurgence. The psychological thriller is set in a small American town, which is host to all sorts of dark secrets. Your actions will have permanent consequences in a story driven adventure format enhanced by it’s atmospheric visuals. The screenshots currently available make the title stand out among the indie crowd present this year. It will launch for PlayStation 4, Xbox One, PC, and Nintendo Switch later this year. Growbot is a visually striking game that uses a style of pixel art that stands out even among the growing crowd of beautifully drawn 2D indie games. It’s unique style features in a point and click adventure game with some puzzle solving. The title is single player and aims to launch on Windows, PC, Mac and IOS next year. The taste available at EGX should convince you it’s worth keeping an eye on. Following up Never Alone is not an easy task. For their next project, the creators have partnered with the BBC and leading ocean experts to create an adventure game allowing exploration of the deeper parts of the sea. The game is visually stunning and promises to be interesting experience. While the beauty of the underwater is notable enough, the game will also feature narrative elements and decision making. Beyond Blue is an impressive title that should not be missed it will be available on PC and consoles in early 2019. If undersea exploration leaves you yearning for something more traditional, you probably still wont wont find it with Mable & The Wood. It is a fantasy adventure platformer with a dark story behind it. After being resurrected by a cult, you play as a girl who must kill giant beasts to save the world. It promises mechanics to change shape, a non-linear platforming world and a bizarre plot. Mablewill launch on PC, Mac and Linux sometime this year. Nippon Marathon is a game that demands to be played to evaluate it. A party ragdoll racer, a loose approach has been taken to physics to make racing through japan a chaotic co-op experience. The game promises endless possibilities for multiplayer matches, while supporting solo play. It’s available in early accesson Steam now. A visually stunning title, Pode blends exploration aspects with puzzle solving to create a unique experience. It’s playable both in co-op and single player, with an entire story playable in co-op it stands out as Switch multiplayer experience. You explore cave systems left by a long lost civilisation, discovering their secrets in a beautiful world. Pode is available now on Nintendo Switch. 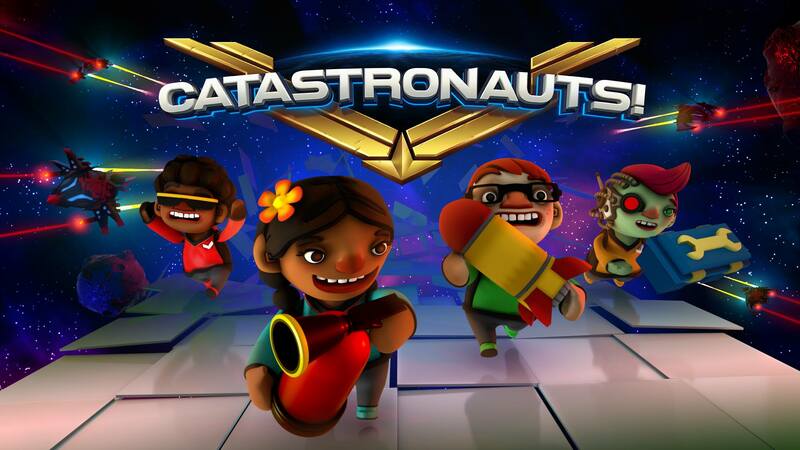 Catastronauts is a co-op orientated space-faring simulation. Up to four players work together in a spaceship to handle the ever increasing problems of staying afloat in short session levels. It’s been upcoming for a little while, and is aiming to launch on PC and consoles later this year. The game is bags of fun to play with others. While tense, it’ll allow you to blow off some steam after days of queuing to reach the Sony booth. This beautiful platformer puts you in control of a Jawa-like character named Soli. You transverse the game with the ability to create portals to travel to other worlds. This mechanic gives it a fresh feel for a platformer, combined with interesting visuals Unbound is definitely worth killing half an hour with. It’s aiming to release in May 2019 on Steam. This game puts you in the position of a struggling band who happen upon a time travelling van. This story driven title is likely to take every advantage of that promising premise. Yellow Rock Road also promises a unique rhyme game section to balance this out with a complex control scheme. It’s launch date and platforms are currently unknown but more details should materialise in September.